We had a special guest speaker today from Corning, Inc., which is the world leader in specialty glass and ceramics. You may have some of their products in your household! We met with a representative from Corning who gave us an overview of what they do, how they have a need for good "home-grown" scientists, and that they believe best practice science instruction is critical in obtaining that talent. Corning, Inc. graciously funded our modeling workshop and continues to support the work of the modeling instruction program year after year. Thanks Corning!!! But some participants are still finding it tough to keep focused on the article, and it is detracting from what we are there to do. Some offer anecdotes of what they do in their (soon to be former) traditional-style chemistry classrooms and then comment on each others' anecdotes. Keep in mind that if you came to take a workshop on a new way of teaching chemistry (modeling instruction,) chances are that continuing to talk about your traditional classroom approach and lecture-based instruction isn't helping you get the most out of the workshop. Business picked up after that with our gas collection lab next. We set out to see if we could determine the density of a gas produced by dropping alka-seltzer tablets in water. We had to work to devise an apparatus to collect and measure the gas volume and mass. 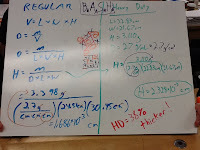 This was a tough lab to get right; there were many small sources of error and places to make mistakes. 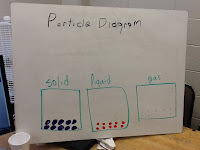 We again took class data of mass and volume points to find the density of the gas produced in the experiment using a graphical analysis and derivation of a mathematical model to represent our data. 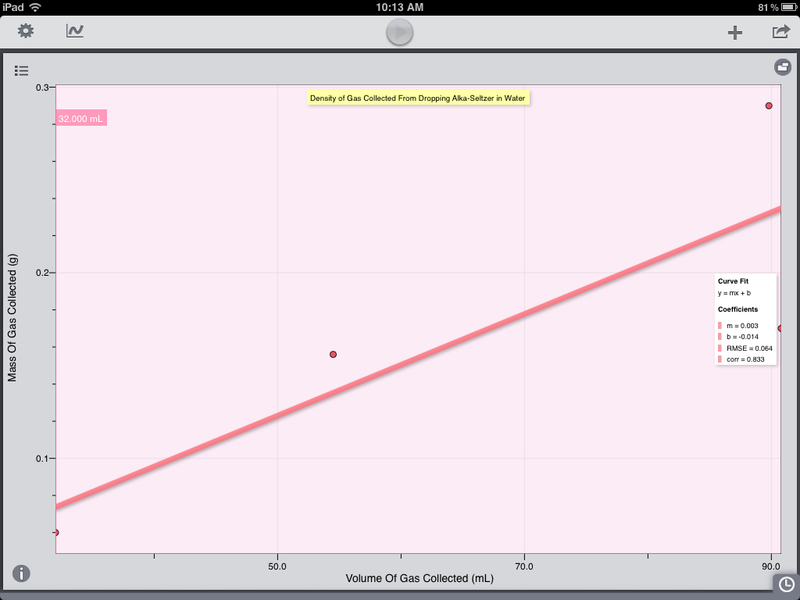 The linear relationship allowed us to easily determine the density of the gas. 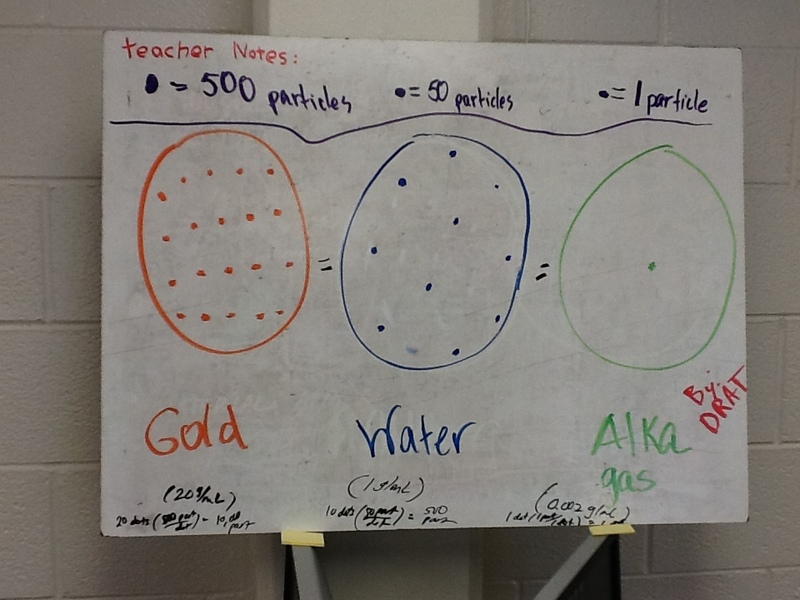 Then it was on to comparing the densities of a solid, liquid, and a gas. 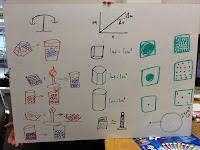 We compared them using particle diagrams and a couple of interesting things came out of this presentation of whiteboards and debrief. 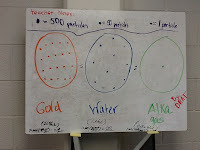 Groups fell into two schools of thought: 1) differences in densities between the states of matter are a result of the number of particles distributed in the volume, and 2) the differences were a result of the size (mass) of the particles in the volume. We had to pick one, the other, or some combination of both for our accepted model to arrive at consensus. 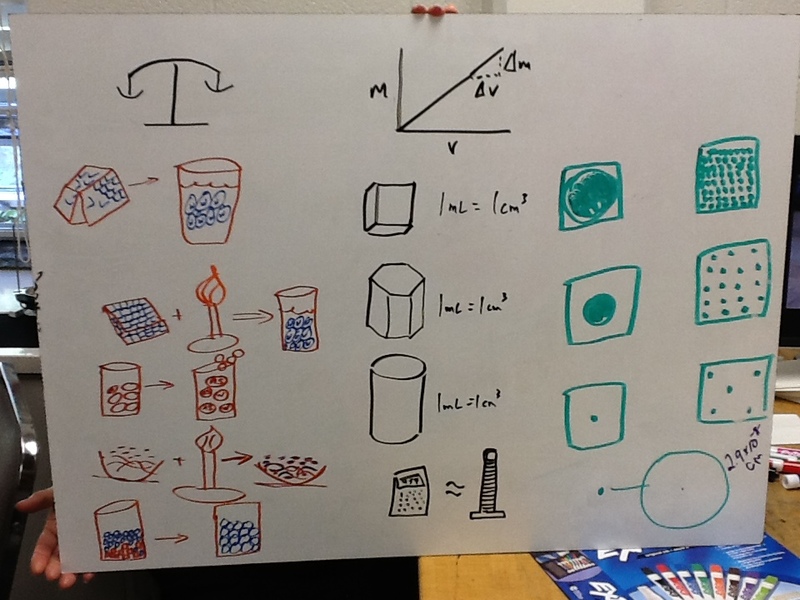 In student-mode, we came up with these ideas, but in teacher-mode we talked it out and realize that the latter explanation implies that different substances are made of particles having different masses. 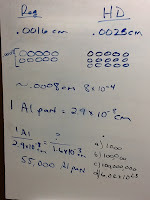 This was astonishing to us, because we weren't intending that implication when we drew what we did on the whiteboards. 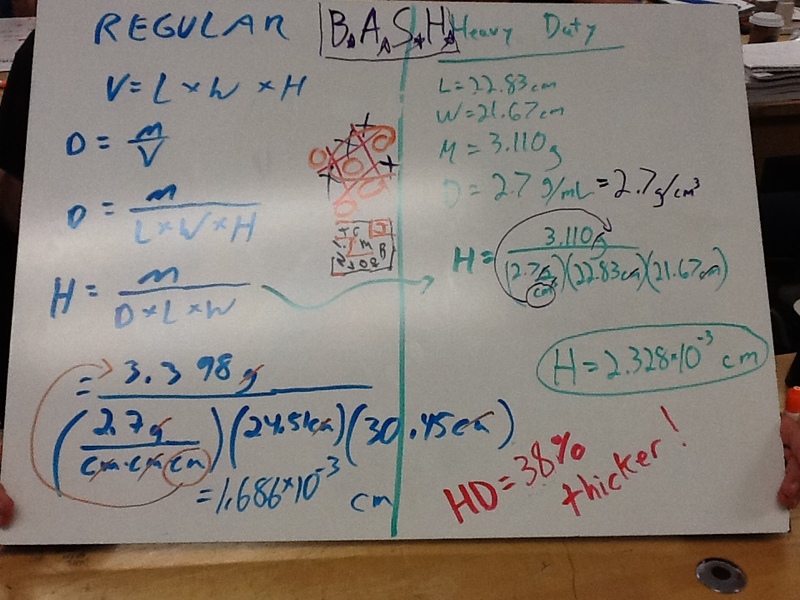 Our instructor led us to see that this is how students will be able to uncover that each element has its own mass. The secondary outcomes of our labs were mind-blowing today. 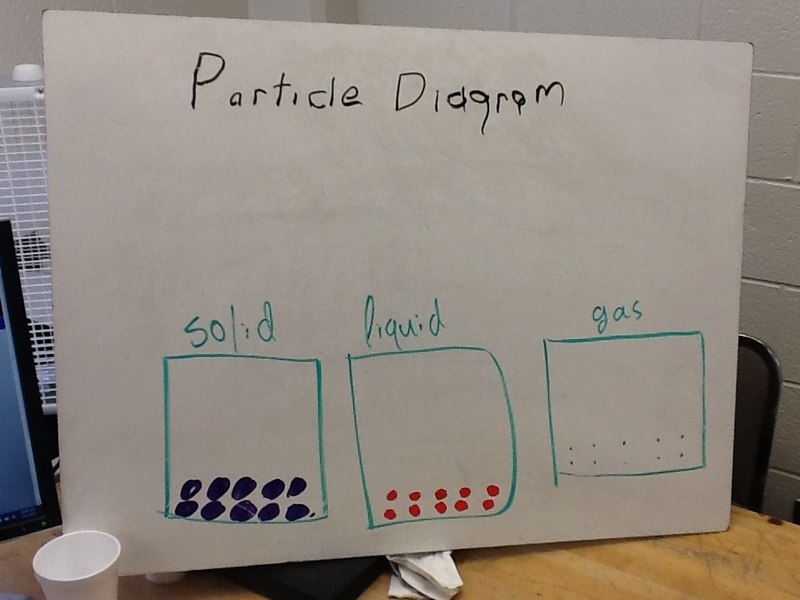 Having students be able to abstract that particles of different substances have different masses and be able to estimate the size of a particle of a substance is just incredible. Any other approach would simply just tell them those "cold hard facts," but someone had to discover it somehow at some time, didn't they? So, why can't our students think like famous chemists? 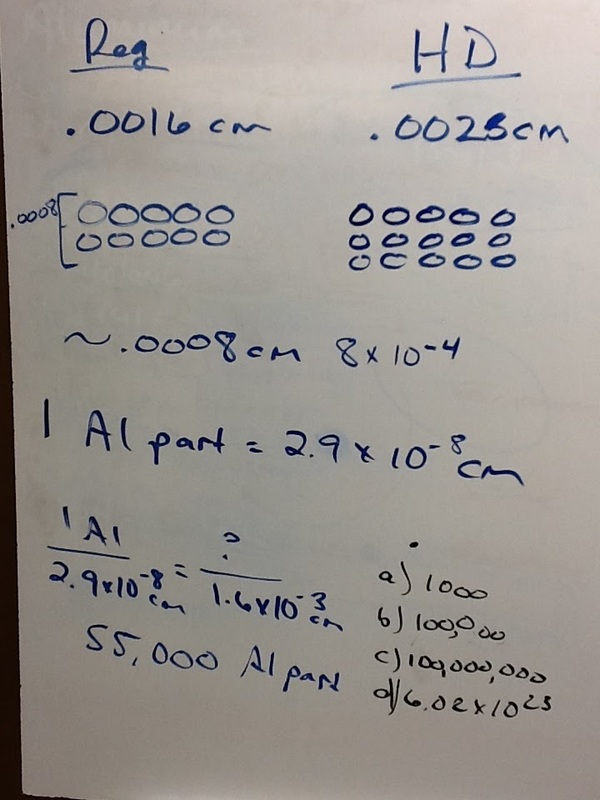 This led into a discussion of the relative size of particles compared to items within our scale factor of understanding by common experience. It's tough to fathom the microscopic, but students often misjudge how small particles (atoms) are based on some prior science instruction or textbook in elementary school. For example, do you know how many particles (atoms) of carbon would fit inside the period at the end of a sentence? We proceeded to discuss how we might help students appreciate the scale of the atomic universe and the particles we have been investigating. This is something that can be helped by computer simulations. 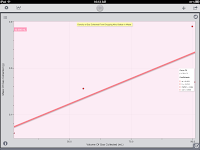 The scale of the universe applet and now the version 2.0 were created by two teenagers. Go ahead, check these out--you'll thank me later! Getting right into unit two, we were shown two events and asked to make observations and explain what we observed using our current iteration of our model. 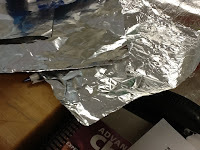 The two events were: 1) opening a freshly popped bag of popcorn in the doorway of the room and determining when each person could smell the aroma, and 2) watching two different food colorings get dropped into equal-volumes of water, one hot and the other cold. Everyone had to storyboard what they thought was happening at the particle level in both situations. 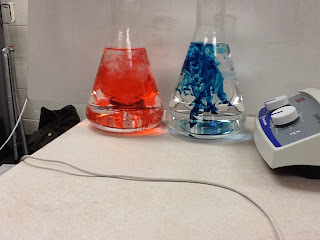 The two had a lot in common; however, in the situation of popcorn smell, no one represented the particles that make up air, but everyone considered the particles of water in their depictions of the food coloring in the flasks. Our discussion of the two situations moved in the direction of considering now the motion of particles and the need to talk about energy in our model. Our session broke at that point, and I'm looking forward to our discussion of energy tomorrow. It will likely be eye-opening for most, because energy is such an illusory concept to everyone, even some of the most advanced content experts. From my physics modeling experience, I know that the treatment of energy is one of the BEST elements of modeling instruction and chemistry treats energy similarly in their model. Language we use as teachers is doesn't mean very much to students, because our words used to talk about a concept are based on our experience and level of knowledge. Since students' experience is different than teachers', we cannot expect that even the best lecturer will be very effective in communicating much more than memorable facts. Give students the opportunity to construct their knowledge using their lexicon and in talking with each other. After all, scientists share findings and discuss with one another in a peer-review setting, why should science students? Textbooks for chemistry classes are written for people who already know the story; they put forth facts without much justification and encourage readers to ascertain knowledge based on trust of the author. Textbooks are just like PowerPoints, and "PowerPoints are boring" (Dwight Shrute.) For an introductory level course in chemistry, authentic experience is a far better teacher than a textbook. Make the teaching & learning process more transparent to students, because student perceptions of process affect their performance with it. If students are left to presume things about the process, they might make misjudgments about it and develop a negative attitude toward what they don't understand. 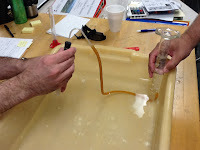 This can be done with mini-modeling activities (such as height vs. wingspan of students) where students develop a model and are asked at different points in the process, "why do you think we did this?" Cognitive dissonance will arise in students early in the year with modeling instruction if it is their first experience with it. They need to know that what they are feeling is natural and it is okay. Helping them see the process and motivation behind what we do helps garner buy-in from them and calm their nerves. Building relationships in the modeling classroom is essential to being able to do modeling instruction. Early in the year, you can do class activities that bring students together and create a positive classroom culture where they feel safe to take intellectual leaps without harsh judgement. Again, this day was especially packed with lots of good stuff, and I hope that I captured it all in essence here. Look for a follow-up on building relationships in the modeling classroom soon. Wonderful, it is very interesting article related to household management. By reading this people would be able to learn more about ceramic industry and the products that are made by cements and ozessay service share unique material. They also can learn about their amazing products.